In an effort to revive confidence in the country's ailing economy and consolidate his position within the regime, Syrian President Bashar Assad launched a major cabinet reshuffle on December 13. The number of Ba'ath party members in the new cabinet fell from 26 to 19, reflecting an increase (from 5 to 8) in the representation of parties in the National Progressive Front, a coalition of leftist groups aligned with the Ba'ath party, an increase in the number of political independents (from 5 to 7), and an overall reduction in the size of the cabinet (from 36 to 34). Prime Minister Muhammad Miru and the heads of most politically relevant ministries retained their positions, with the exception of Interior Minister Muhammad Harba, who was replaced by Brig. Gen. Ali Hammoud. Hammoud had been appointed head of the General Security Directorate just two months ago. Several key ministries related to economic affairs were awarded to technocrats with doctorates from Western universities and experience with free market economies. The new minister of economy and foreign trade, Ghassan al-Rifai, has a Ph.D from Sussex University in Britain and worked for the World Bank prior to his appointment. Rifai's experience is ideally suited to the tasks of revitalizing Syrian relations with international financial institutions, jump-starting stalled negotiations with the European Union for a partnership agreement, and accelerating Syrian entry into the World Trade Organization. Minister of Industry Issam al-Zaem, Finance Minister Muhammad al-Atrash, and Tourism Minister Agha al-Qalaa are also political independents with Ph.Ds from British and French universities. Fayek al-Mir, a member of the Communist Party Political Bureau (CPPB) headed by Riyad al-Turk, was arrested on December 20 while departing the city of Homs, 90 miles north of Damascus. According to Syrian opposition sources, he was carrying copies of a documentary film about Turk at the time of his arrest and was released December 23. Mir, who spent 12 years in prison after being convicted of membership in the CPPB, was released a few years ago. Turk was arrested in August and is currently on trial for slandering the late President Hafez Assad. Agence France Press reported that German authorities arrested two Syrians suspected of spying on December 12. Frauke-Katrin Scheuten, a spokesman for the German federal court, identified the suspects only as "Ahmad I," 49, the head interpreter for the Syrian embassy, and "Ahmad al-Y," a political science student at the University of Mainz in western Germany. "Ahmad I" was subsequently released due to lack of evidence, but "Ahmad al-Y" remains in custody for allegedly spying on opponents of the Syrian government residing in Germany since 1996 and for attempting to recruit Syrian students at various universities in west and central Germany to work for Syrian intelligence. On November 19, US Under-Secretary of State for Arms Control and International Security John R. Bolton publicly accused Syria of being one of six countries pursuing the deployment of biological weapons. "We believe that Syria . . . has an offensive BW (biological weapons) program," said Bolton. The Bush administration has blocked Syria's application to join the World Trade Organization, citing Syria's role as a state sponsor of terrorism, its pursuit of weapons of mass destruction, and its efforts to enforce an Arab League boycott of Israeli goods - a violation of WTO anti-discrimination rules. In recent weeks, Syria launched a concerted diplomatic effort to drum up support for its membership in the WTO, but American officials intervened to prevent the application from being considered during a December 19-20 meeting of the WTO General Council. A report issued by the US embassy in Damascus stated that "Syria strictly enforces the Arab League embargo of Israel," a fellow member of the WTO. The Arab League's Principal Bureau for the Boycott of Israel is headquartered in Damascus and the Syrians hosted its first meeting of delegates since 1993 earlier this month. A brother-in-law and two nephews of MP Mamoun al-Homsi, who is on trial for attempting to "change the constitution by illegal means", were arrested during a court session on December 26 on charges of "provoking disorder" when they allegedly chanted slogans in support of Homsi. Homsi's lawyer said that the arrests were intended to silence his client, who had earlier cried out "you are dishonest" to the judge after he rejected Homsi's requests to summon former Interior Minister Muhammad Harba and other witnesses to testify on his behalf. Homsi's trial will resume on January 23. The trial of a second opposition MP, Riyad Sayf, has been adjourned until January 24. Trial dates for eight other dissidents arrested in August, including CPPB Secretary-General Riyad al-Turk, have not yet been set. Former Minister for Economic Affairs Salim Yassin and former Minister of Transportation Mufid Abd al-Karim were convicted of embezzlement, accepting bribes, and "destroying the national economy" on December 8 and sent to prison for ten years. According to the indictment, both accepted large bribes to purchase 6 Airbus I-320 airliners for $374 million, far exceeding the worth of the planes, estimated at $250 million. 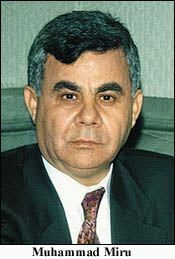 Former Prime Minister Mahmoud al-Zoubi was also implicated in the scam, but committed suicide (supposedly) in May 2000 to avoid arrest. Another defendant, Madrid-based businessman Mounir Abu Khaddour, was convicted in absentia and sentenced to ten years in prison. According to a December 15 report in the Energy Intelligence Briefing, a publication of the New York-based Energy Intelligence Group, Iraq now exports around 220,000 barrels of oil per day to Syria without UN approval. Iraq began exporting oil to Syria via a newly reopened pipeline in November 2000. Syria refines the Iraqi oil and consumes it locally, allowing it to export more of its domestically-produced oil. The report notes that, as of December, Syria was producing around 510,000 bpd, consuming 295,000 bpd and exporting 437,000 bpd. On December 4, the Syrian authorities released 11 Syrian political prisoners, as well as 5 Jordanians and 6 Palestinians. The 6 Palestinians and 4 of the Jordanians (who are of Palestinian descent) are members of Yasser Arafat's Fatah movement who were arrested in Lebanon in the 1980s. The remaining Jordanian and 5 of the Syrians are members of the Muslim Brotherhood, which launched a bloody rebellion against the Syrian regime in the late 1970s. The other 6 Syrians are reportedly members of the pro-Iraqi wing of the Ba'ath party. Jordanian officials contend that there are "hundreds" of Jordanian prisoners still held in Syria. Estimates of Palestinian prisoners held by the Syrians vary widely, from a few hundred to a few thousand. Typically, the Syrians have released Jordanian and Palestinian prisoners on an arbitrary basis in return for political concessions.